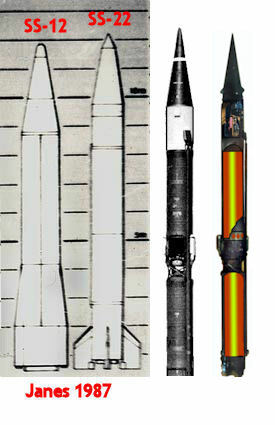 The SS-12 missile was initially assessed as a liquid-fuel, single-stage system similar to the SCUD, but with greater range, accuracy, and size of warhead. A 1973 NSA report indicated that range information derived from testing was based on "RADINT", or radar intelligence, rather that intercepted telemetry. Possibly there was no intercepted telemetry to confirm the propulsion configuration. The use of the same TEL as the SCUD would have led to the simplest concluson that it was just a big SCUD. All previous missiles in this range class had been single state liquid propellant rockets. In fact, it was a two stage solid propellant missile. Seemingly, the two stage solid fuel missile was initially designated the SS-22, but when it was realized that the original SS-12 had also been of this configuration, the "new" missile was re-designated SS-12B, but by then the horse was out of the barn. The open source record is silent as to the detailed sequence of this process, or as to what did they know and when did they know it. The SCALEBOARD was a front- and theater-level weapon system that gave the Soviet commander a nuclear capability. SCALEBOARD appeared only with Soviet forces. The midrange missile can be stationed in the western part of the USSR and still hit important targets in Central Europe. The Soviets first deployed the SS-12 Mod 1/SCALEBOARD A in the mid-1960s. The new SS-12 Mod 2, introduced in 1979, had largely replaced it. The new Mod 2 missile had the same range (900 kilometers), but offered improved accuracy. The 1987 INF treaty called for removal of all SS-12 systems from the Soviet inventory. In the early 1980s, many publications began referring to "follow-on" systems for both the SCUD and SCALEBOARD. The follow-ons were labelled the SS-23 and SS-22, respectively. The SS-23 reportedly replaced the SCUD missile during the early-to-mid 1980 time frame. It was carried on the same transporter-erector-launcher, and its primary improvements reportedly include increased range (500 kilometers) and improved accuracy. The SS-22, first deployed in 1978, was replacing the SS-12 SCALEBOARD system within a few years. Like the SS-23 improvements over the SCUD, the SS-22 provided longer range (1,000 kilometers) and greater accuracy than the SCALEBOARD. In addition to increasing Soviet battlefield capabilities, the introduction of a new generation of follow-on systems potentially frees some of the earlier weapons for wider export to the third world. In fact, the Soviets began exporting the SCUD outside the Warsaw Pact as early as 1973, even before the reported fielding of the SS-23. The SS-12 SCALEBOARD, in service since the mid-1960s, was replaced beginning in 1979 with a new missile that had the same range (900 km) with improved accuracy. Initially considered to be a new missile, designated the SS-22, the SS-12M SCALEBOARD B [also known as the SS-12B and the SS-12 mod 2] was subsequently assessed as an improved version of the earlier Scaleboard. By the early 1980s the Soviets were replacing older shorter-range Scaleboard missiles with SS-22s, and were developing the new SS-23 as a follow-on to the Scud missiles. The SS-22 missile had the range to cover a substantial portion of NATO Europe even from its deployment areas within the Soviet Union. The Intermediate-Range and Shorter-Range Nuclear Forces [INF] Treaty was signed in December 1987 and entered into force on 01 June 1988. The fundamental purpose of the INF Treaty was to eliminate and ban US and former USSR (FSU) ground-launched ballistic and cruise missiles, as well as associated support equipment, with ranges between 500 and 5500 kilometers. SS-12 and SS-23 transporter-erector-launcher (TEL) vehicles were eliminated at Stan'kovo. The first Soviet SS-12 missile was eliminated at the Saryozek Missile Elimination Facility on 01 August l988. The last of 718 Soviet SS-12 missiles was eliminated at the Saryozek Missile Elimination Facility on 25 July 1989. In February 1997 a top Cuban military defector, Alvaro Prendez, alleged that Cuba was developing biological weapons were to be delivered by five Soviet-made SS-22 missiles that were deployed near the central city of Santa Clara. Prendez and other defectors had heard rumors that the missiles were shipped from Russia to Cuba as late as 1991. Cuba is not known to have any SS-22 missiles, and these claims appear unfounded.